LOCATION: ? 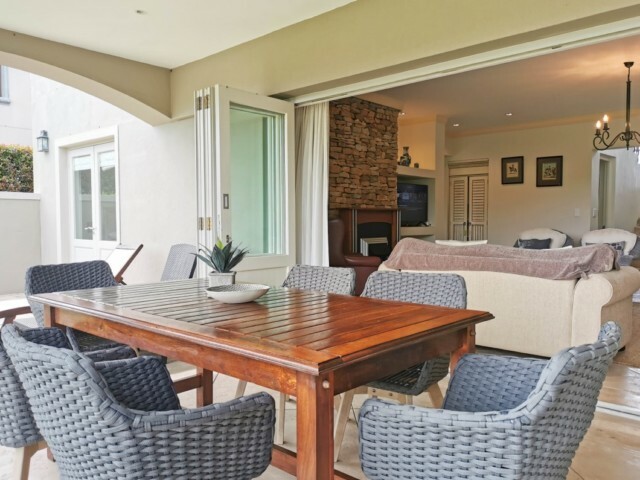 7mins drive/3.5 km from Plett central & energetic walk to Lagoon through Goose Valley Golf course & beach. Spacious, double storey traditional design style house. Downstairs houses the open plan living area with 2 en suite bedrooms, opening out onto covered patio overlooking Tee #3. Upstairs remaining 2 en suite bedrooms. BEDROOM 4: Main bedroom, king en suite (large bath with hand shower/shower/toilet), fitted with fire-place and opening onto uncovered balcony overlooking golf course. - All bedrooms carpeted, fitted with ceiling fans and wall heaters. About Turtle Creek Golf Estate: a stunning eco & lifestyle golf estate development on the Goose Valley Golf Course in Plettenberg Bay. This secure development offers 24 hour patrolled security within the confines of the superb Gary Player Signature Goose Valley Golf Course. Homes conform to a controlled Mediterranean design theme and there are only sixty homes, making this estate a very exclusive and hot golfing investment. The Goose Valley Golf Estate offers following facilities: Pro Shop, Halfway House, and Restaurant.